Although released as two different sets with different numbers, the 2129 and 8205 Bungee Blasters are exactly the same model in a different color. They were clearly intended to be used as a pair for competition. They were released in 1997, a year before the official Competition series was launched, but were an obvious prelude to that concept. 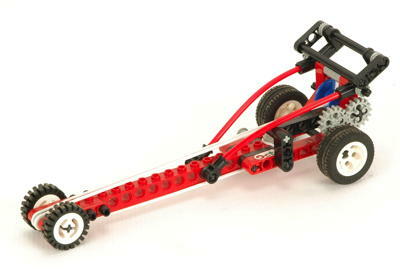 These were pure playsets with a single function: racing. 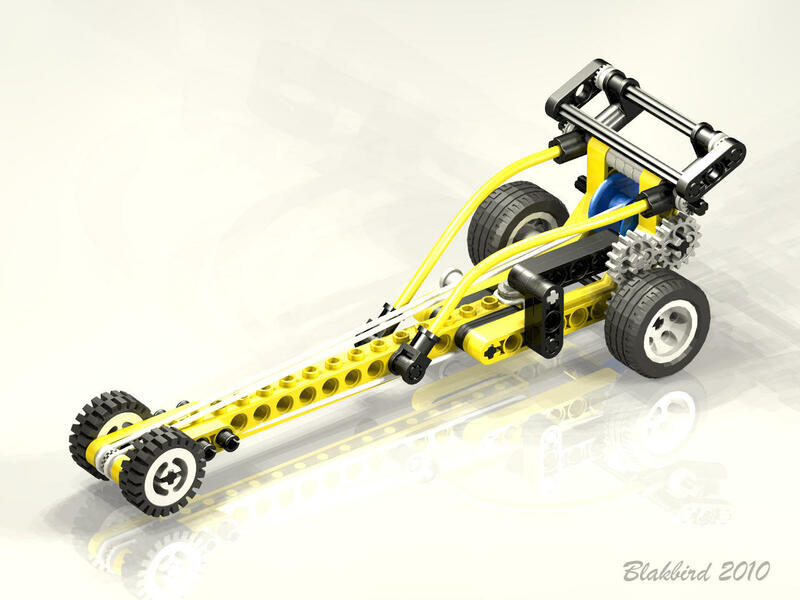 The availability of a surprisingly durable bungee cord made the concept possible. 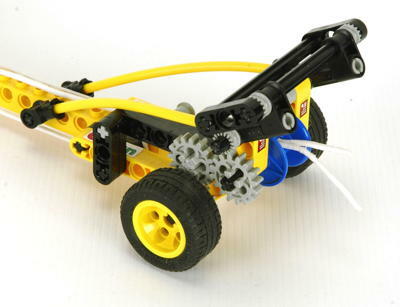 A bungee cord connects from an anchor point on the chassis to a drum mounted on the rear of the vehicle. This very long cord travels the whole length of the vehicle twice, wrapping around a pulley at the front. 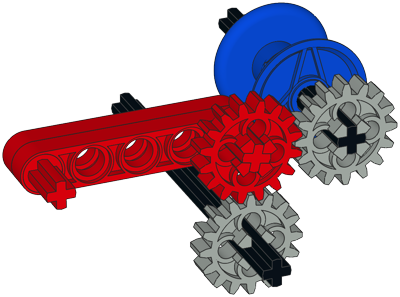 When the vehicle is pulled back, a series of three 16 tooth gears connecting the drum to the rear axle stretches the elastic band. 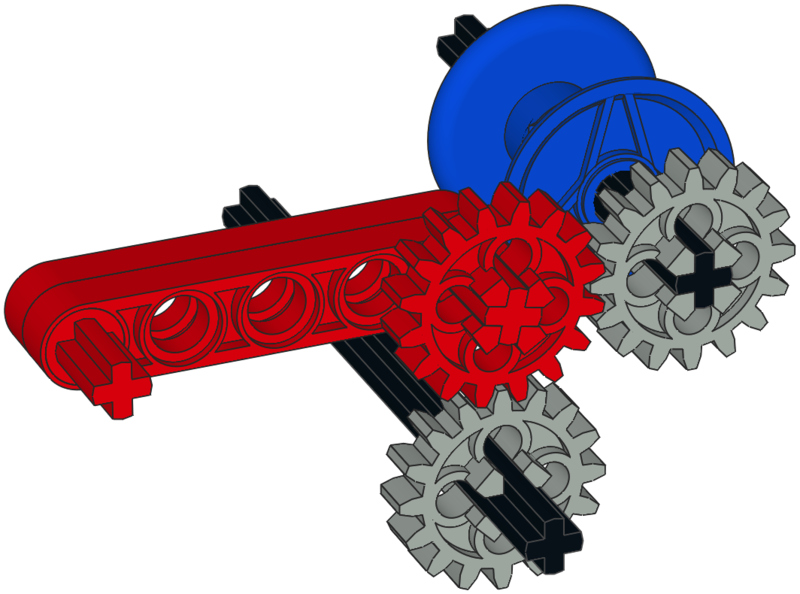 The middle idler of these gears is attached to a floating link (shown in red). 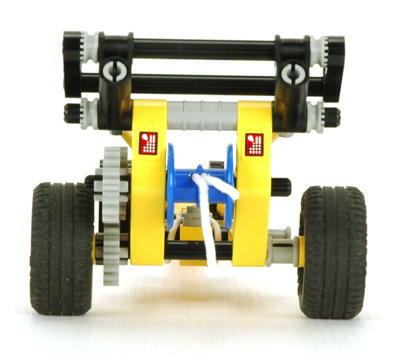 When pulling back, the forces on the gear cause it to engage the wheel axle, connecting the drum to wheels. 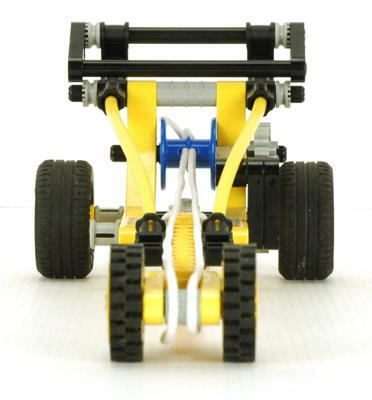 However, when the vehicle is released the forces on the gear from the bungee cord cause the link to float up and disengage from the rear wheels allowing the vehicle to move forward. The cord can be stretched very considerably, allowing rapid forward motion. In fact, there is so much torque at the wheels that they are likely to spin rather than propel the vehicle unless the traction is excellent. 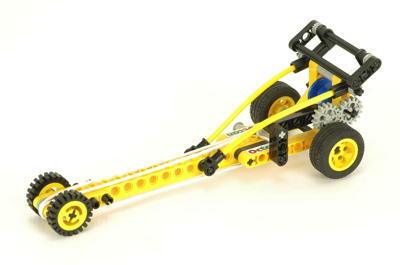 This set has 2 of the smallest VR rubber tires and wheels on the back and the oldest wheels and tires on the front.